Laser danger signs should be placed at every entrance to areas in which lasers are in use. Laser danger and laser warning signs provide information about the type of laser being used and allow the person entering the room to take precautions prior to entering. Laser danger and warning signs are required by OSHA and recommended by most other organizations related to laser safety. 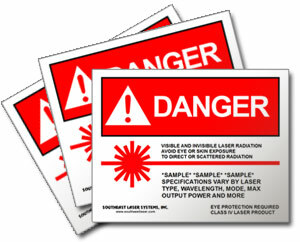 Laser danger signs should be specific to the laser wavelength(s) being used. Universal laser warning signs are not appropriate and do not provide proper precautions for medical lasers. For this reason, we do not offer universal laser warning signs.